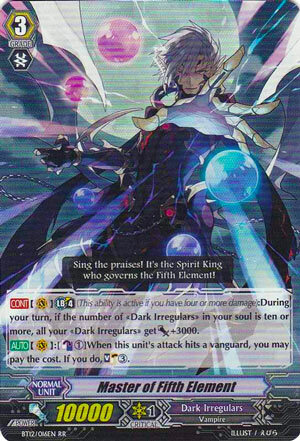 [CONT](VC) Limit Break 4 (This ability is active if you have four or more damage):During your turn, if the number of «Dark Irregulars» in your soul is ten or more, all your «Dark Irregulars» get [Power]+3000. [AUTO](VC):[Counter Blast (1)] When this unit’s attack hits a vanguard, you may pay the cost. If you do, Soul Charge (3). Remember the column plays with Break-Ride Dantarian? Neither do I. Never saw the fuckers competitively together even though everyone knew about it.